I live with a dramatic Sicilian, and predictably, everything he touches turns into kitchen gold. I’ve stopped taking pride in my home cooking, as everything I make pales in comparison to the humble little dishes Peppe throws together. 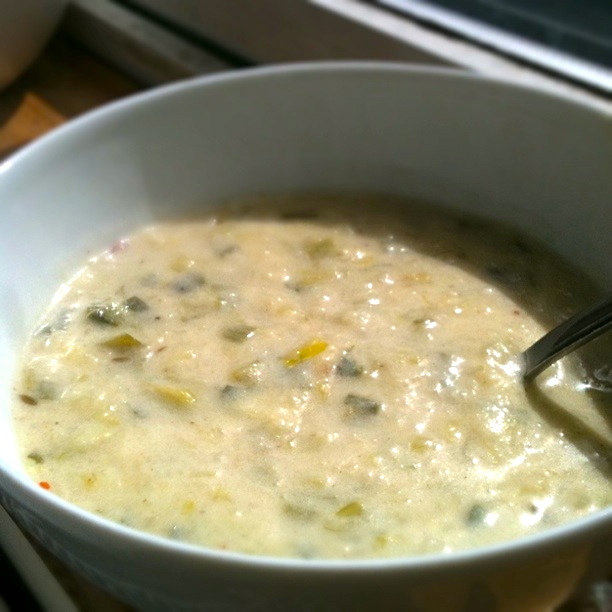 My favourite soup of his so far is very simple: it has courgettes, potato, onion and garlic. The secret is that it is thickened and made savoury with parmigiano, and has tons of aroma thanks to Peppe’s mother’s own olive oil. I’m somewhat of an olive oil skeptic, as I feel it’s being used and abused all the time where it doesn’t quite belong. You need look no longer than Jamie Oliver for examples of that, and to illustrate my point I’ll just point you to this hilarious, simple montage from his shows. However, if strong olive oil belongs anywhere surely it is in Sicilian cooking. Of course, sourcing home-made Italian olive oil might be near impossible, but as long as you invest in a very good quality bottle, you should be on the right way. And spending a bit on the parmigiano and olive oil is worth it: coming home to this after a long night at the office and a damp walk home in uncomfortable shoes feels like the most wholesome experience ever. Start by slicing the onions, and then fry them with a generous splash of olive oil in a deep-bottomed pan. Add the whole, peeled garlic clove after a few minutes, and fry on medium heat whilst you peel and chop the potatoes, and chop the courgettes (keep the peel on). 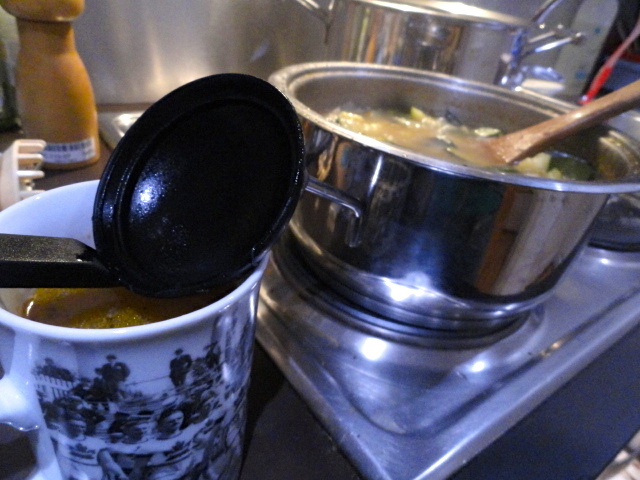 Add the courgettes and potatoes together with the stock cube, and add just enough water to make sure everything is covered. Boil for about 20 minutes or until all the vegetables have softened considerably, then take off the heat and spoon out a little bit more than a coffee mug’s worth of water (you can save and freeze this as stock to use on some other occasion). Take to the side and blitz with a blender for about a minute, or until you have a smooth, rather thick soup. Add salt and pepper to taste. When done, serve in bowls with a generous sprinkle of parmigiano and a few additional drops of olive oil, as well as some crusty bread. 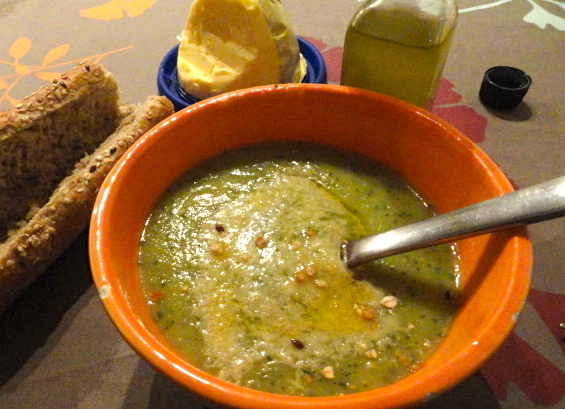 Since I’ve been struck with the season’s first cold, I’ve perked myself up with soup. 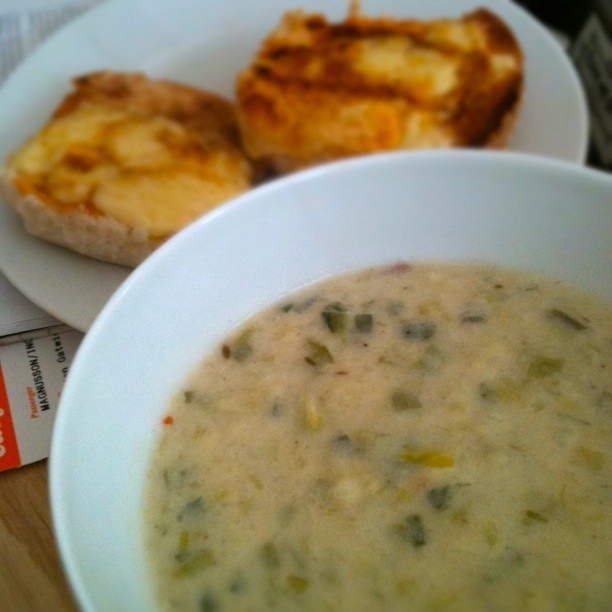 When I was living with eight other students in Birmingham, I used to get the biggest pan in our house, loads of leek and some leftover potatoes and try make enough of this soup to last me a week. But since there were eight of us, and because this soup is so moorish, all was usually gone by the end of the day. Preparing a weekly radio show with my friend Ella, we used to get too impatient to heat up the leftovers and just eat it cold and thick in mugs (admittedly, that could have to do with the amount of wine being involved with weekly radio planning, but I’d rather blame the deliciousness of the soup). 2-4 leeks, depending on size. If possible, get whole ones that aren’t trimmed because the green part of the leeks is perfectly tasty and its more economical using all of them. 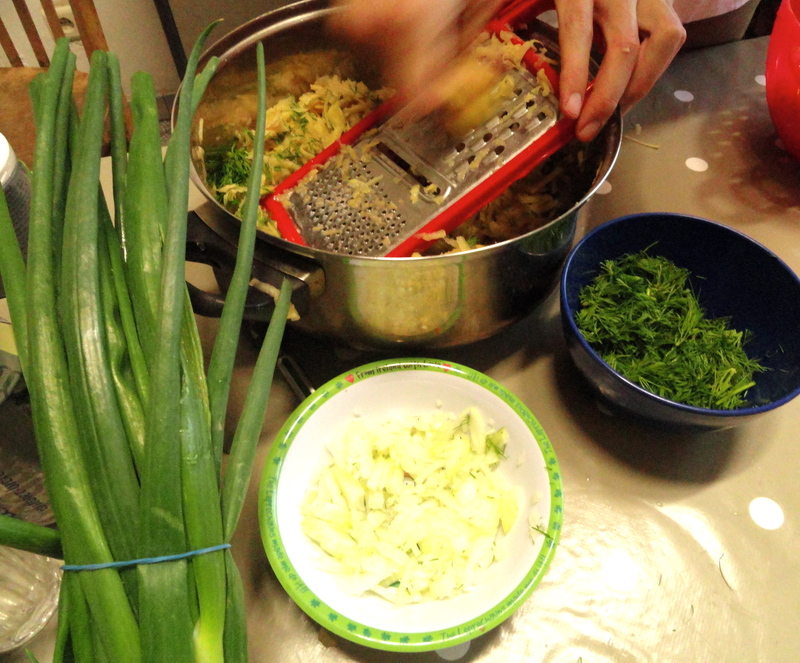 Trim your leeks by cutting off any shabby-lookig bits on the tops, slicing them lengthwise and rinsing in cold water. 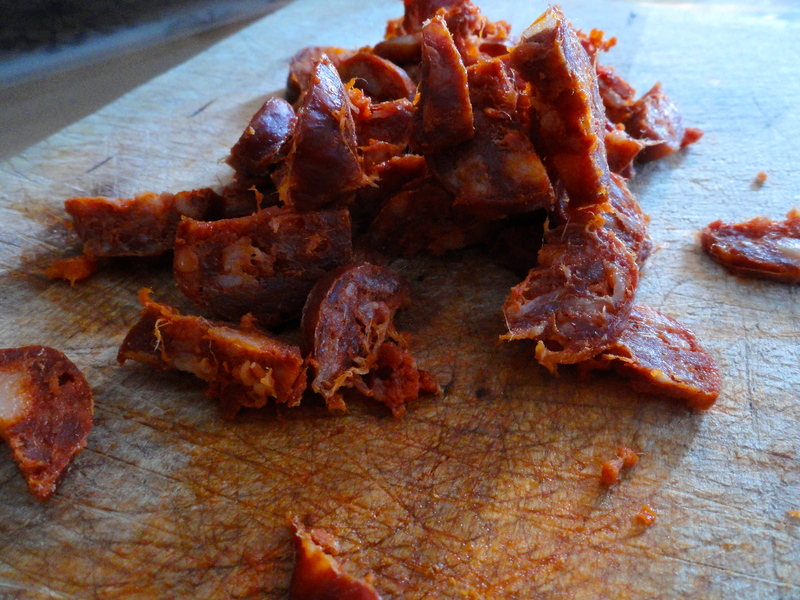 Then slice them thinly all the way up to the dark green bits. Fry in a large, wide bottomed pan in a generous chunk of butter on medium heat whilst you peel and roughly chop your potatoes. Put your kettle on and boil about 1 litre of water. 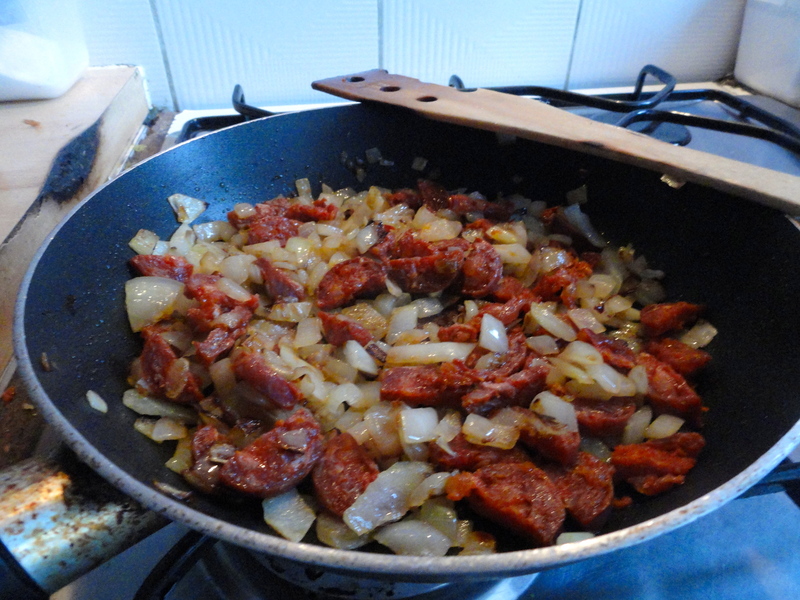 Add the potatoes into the softened leeks, stir an let fry for a minute or so. 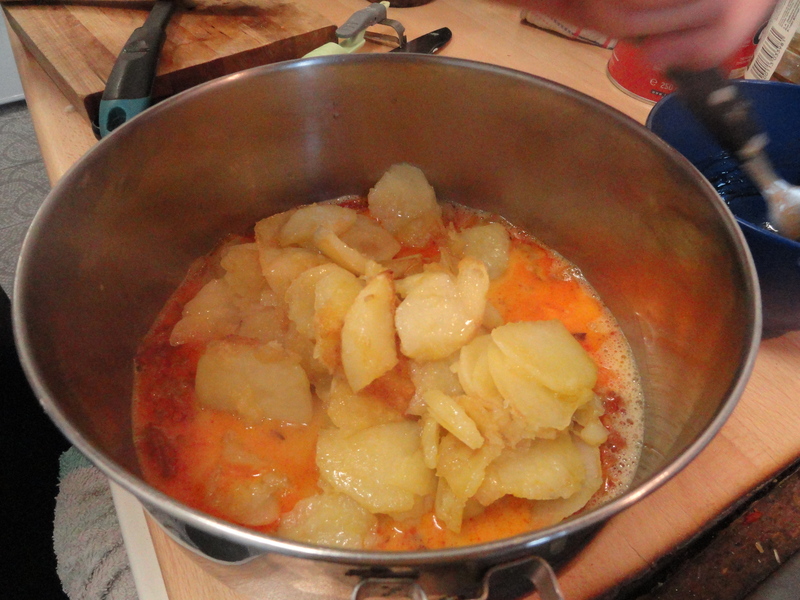 Then add your boiling water and the crushed stock cubes. Let simmer under a lid for about 20 minutes, until the potatoes has softened entirely and can be crushed easily with a potato masher. An english-style potato masher is best tool for this, as it gives you a rougher texture than a blender. 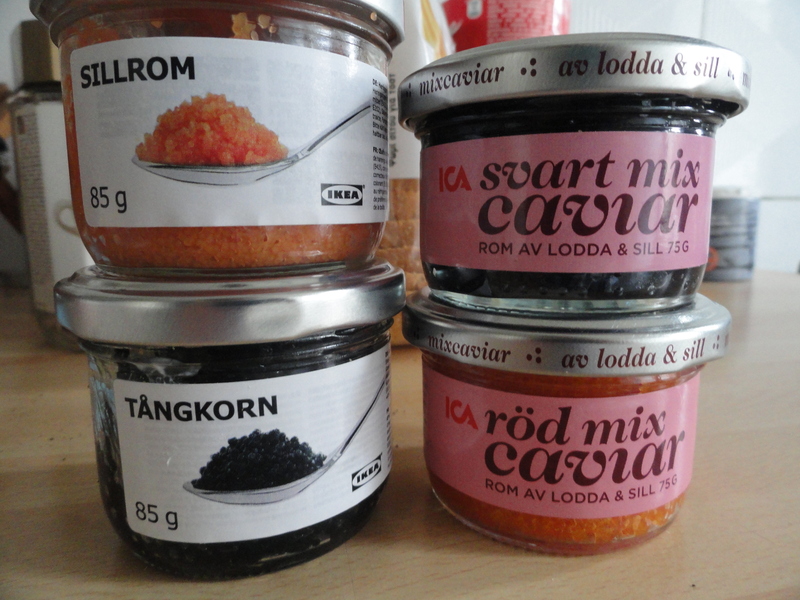 Once you’ve crushed away for a minute or so, add the creme fraiche and start seasoning (whilst still on a low heat). Add a few chili flakes, a few generous splashes of Worcestershire sauce, a few sprinklings of ground nutmeg and some cumin seeds. Also add some salt if the stock hasn’t done that job for you. Take the soup off to cool a bit whilst you put your bread under the grill (if you sprinkle the cheese with paprika it starts grilling quicker and looks nicer). Enjoy. Pardon the following entry, I’m not endorsed by anyone in writing this but I feel so very strongly about this family-run business on Church Street and think more people should go. Think of it as a restaurant review, but for a shop. I would start by saying that Stoke Newington Green is the best greengrocer I’ve ever been to, but giving it some consideration I think it’s the best food shop I have ever come across. Perhaps the best shop full stop. (If it was a restaurant, it would receive 9 meatballs out of 10). Normally specialist shops like boutique bakeries or traditional butchers are beautiful but incredibly expensive, and exist primarly due to the proximity of wealthy yummy mummies (which, admittedly, is true for Stoke Newington). But Stoke Newington Green does three things which put it above those kinds of shops (or your local vegetable market for that matter). 1) It is cheap. Really, really cheap. 2) It is open from 7-11 every day, so most normal working people can pop by after work or on the morning jog. This would not be that amazing had it not for been for the fact that they stock local, seasonal produce as well as exotic spices and vegetables I’ve never heard of. Their fresh herb section involve English herbs I didn’t know existed. They have five different kinds of garlic, including incredibly aromatic fresh variants. 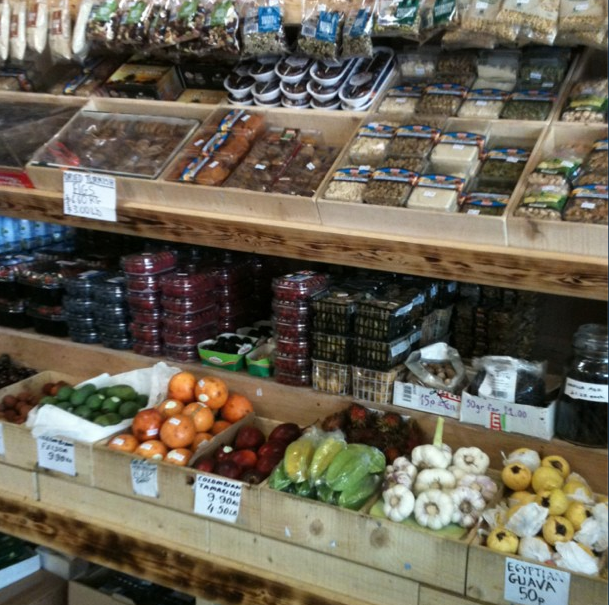 They stock at least six different colours of courgettes and aubergines. All is beautifully stacked up inside the bamboo-walled shop and clear, handwritten signs display price (both kg and lb and sometimes per item), origin and other important details. 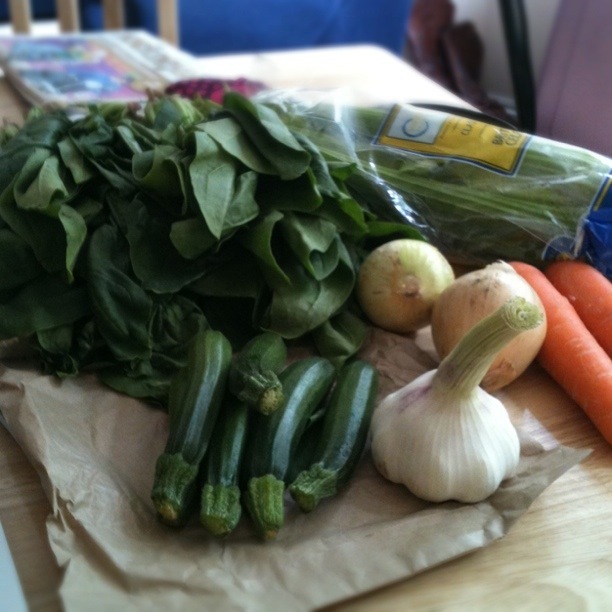 I just arrived home from the shop with two carrots, two onions, a celery, six mini-courgettes, one fresh garlic and two large bunches of spinach. It all came to 3,49. 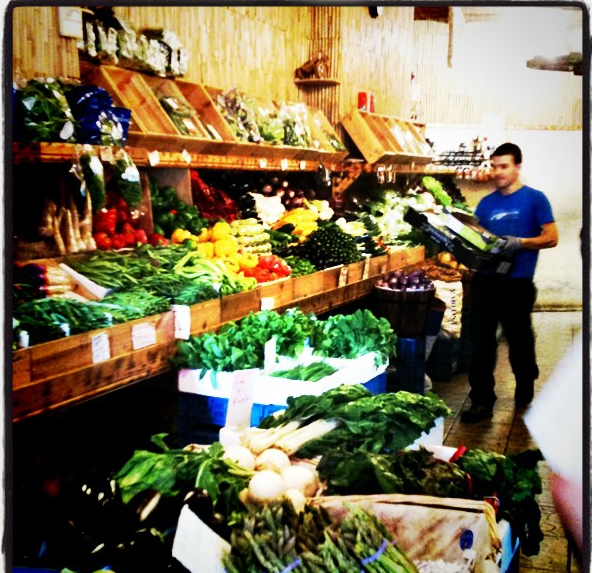 I wish these kinds of green grocers existed all over London. 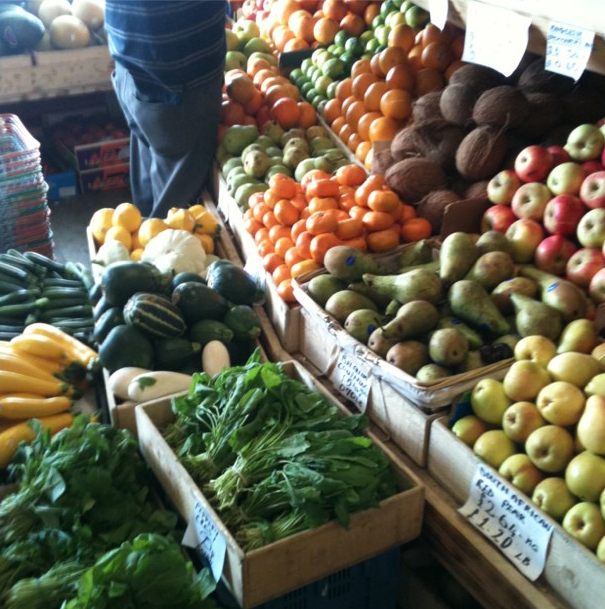 I’d eat much more vegetables, and I’d learn all about the new produce I find in the shop every day. It would be like 5-a-day heaven. Stoke Newington Green, 39 Stoke Newington Church Street, N16 0LU. 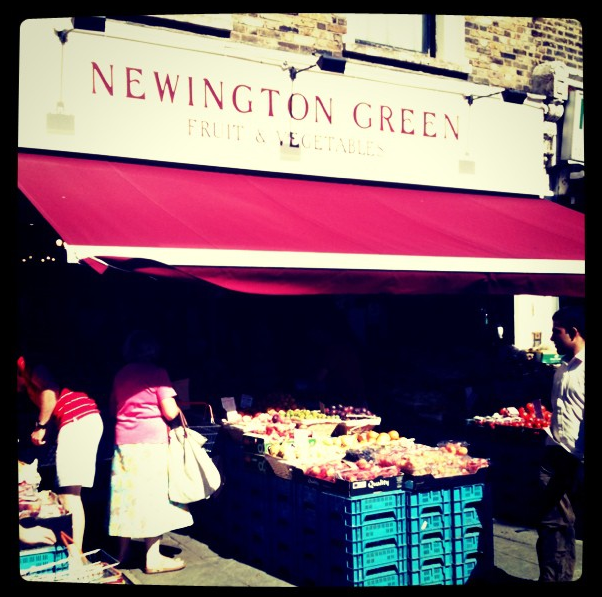 Update: Newington Green Fruit and Vegetables (109 Newington green road, Islington, N1 4QY) is their sister-shop – I have now been and seen and smelled amazing things. This shop is slightly bigger and busier and just as amazing with all the things mentioned above. Both shops can be found on the map here and here. 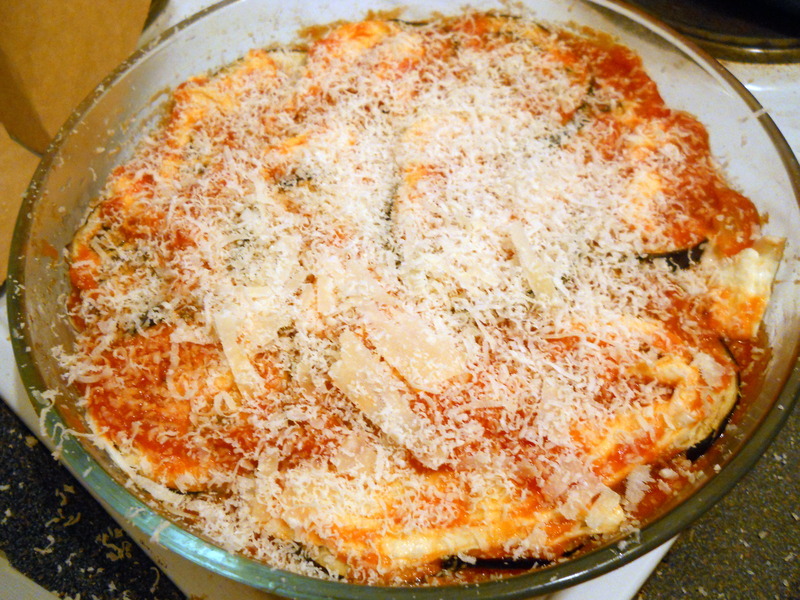 Melanzane a la Parmigiana or aubergine parmigiana for us non-italians is one of my favourite dishes. While it is made solely of vegetables and may seem fresh and healthy it is every bit as decadent as its sister meat lasagna. Typically you deep fry the sliced aubergine before layering it in a casserole dish with tomato sauce, grana padano, and mozarella. 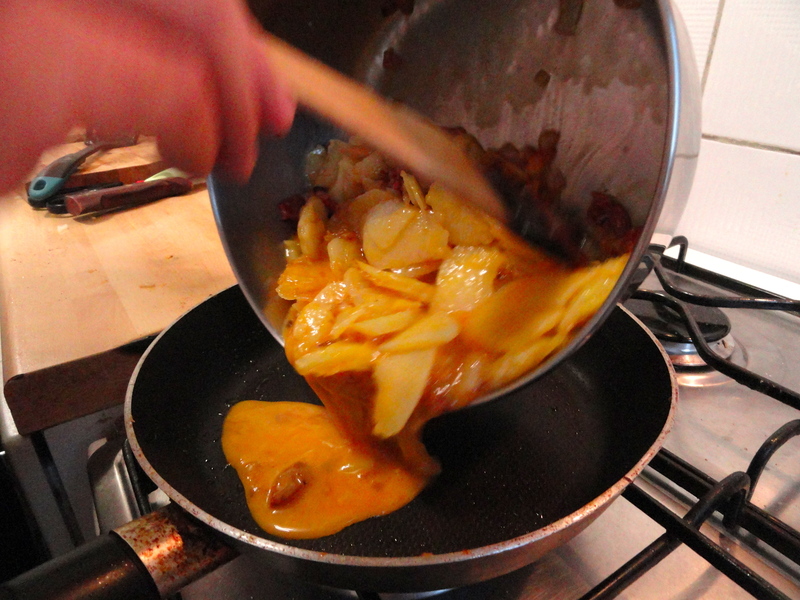 Some even add a tad of bechamel sauce to thicken up the layers. While I love almost everything which is deep fat fried (I lived in Belgium for almost ten years…) during the week I have no desire or patience to deep fry aubergines! 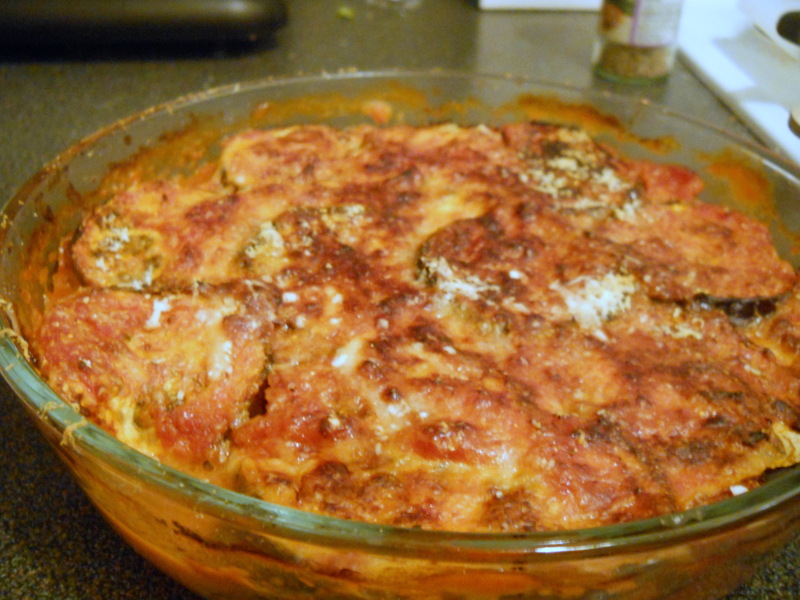 So I looked online for different parmigiana recipes and came up with a combination of all of them which results in a healthier and easier to make parmigiana. 3-4 big purple aubergines, sliced. 1 can of chopped marzano tomatoes (or the best quality chopped tomatoes/passata you can find – it really makes a difference and they are not that much more expensive). 200 grams of grana padano (similar to parmigiano but milder and cheaper), or a mix of grana padano and parmiggiano. 1. 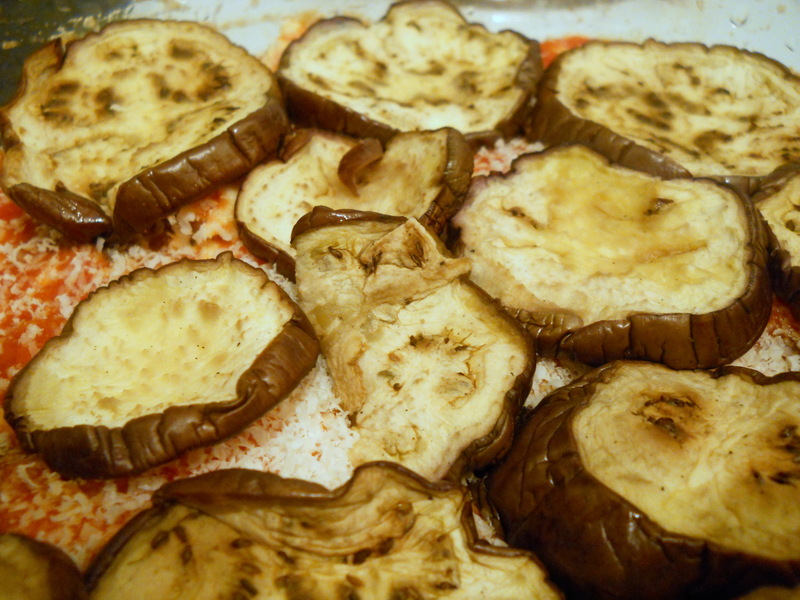 Start by slicing and washing the aubergines and sprinkle them heavily with salt. Put in a container and let it rest for a while to get rid of the bitterness. While they are resting start preparing the sauce. 2. Fry the onion and the garlic in olive oil until translucid. Add the chopped tomatoes and cook in a medium heat for 5-10 minutes, then lower the heat and simmer for half an hour. Finish the sauce by adding the basil and wizzing it in a mixer or smoothie machine. Now it’s time to start layering! 3. Start with a layer of tomato sauce, add a layer of aubergine, another layer of sauce, a layer of grana padano and a layer of mozzarella. Repeat in the same order until you have used up the ingredients. 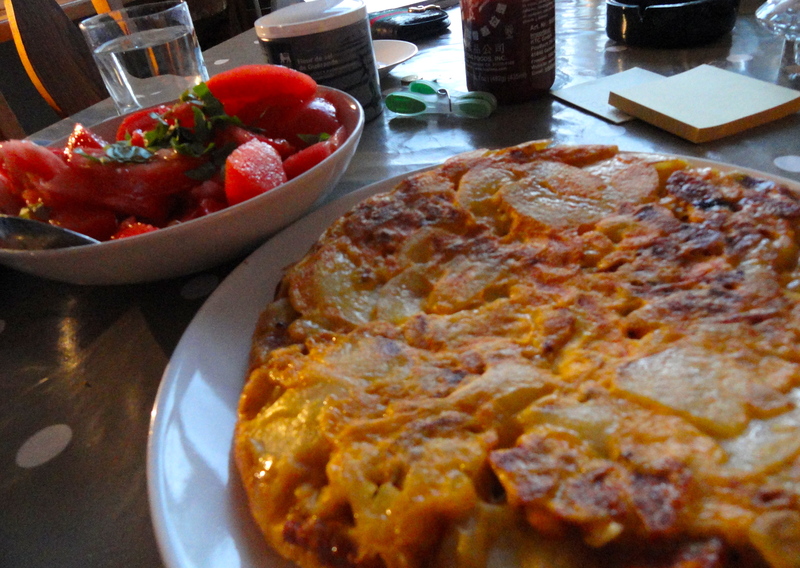 Make sure to add extra cheese on the last layer so it crisps up on top. 4. Cook at 180 degrees in the middle of the oven for about 45 minutes. Let it rest for a bit before you cut into it. 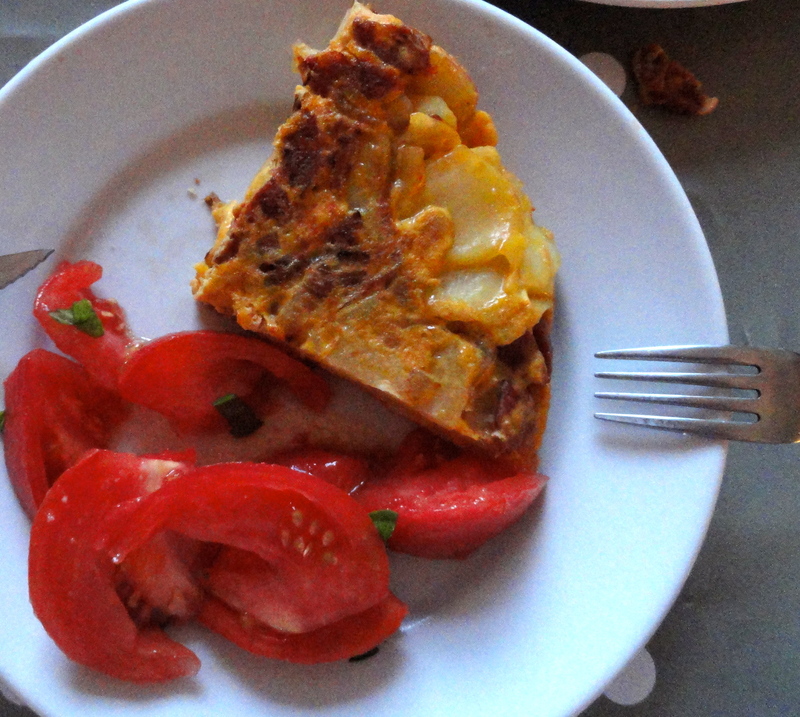 Enjoy a healthy parmigiana which is as good as the time-consuming, deep fried version! This recipe came out of necessity..I had just bought loads of beetroot and being a poor student felt bad about discarding the leaves…So I went online and found out you can just use them as you would use spinach. I had some salad potatoes that were starting to sprout and one egg left in my fridge so I decided to experiment with these three ingredients. It turned out amazing! 1 shallot or half a red onion (finely chopped). 1 clove of garlic (finely chopped). 1. Start by cooking the potatoes with the chopped garlic. I cooked mine in a cast iron pan but you can roast them in the oven too, whatever is easiest. 2. When the potatoes are almost cooked heat a frying pan with some olive oil and fry the shallots. 3. When they start browning add the beets’ leaves and cook until they become soft (add a little bit of water if needed). 4. Take the potatoes and the beets’ leaves from the heat and put them in a salad bowl with some olive oil, some salt and pepper and some fresh herbs (I used coriander, but parsley would work great too). You can also add some balsamic vinegar or some lemon juice if you like. 5. 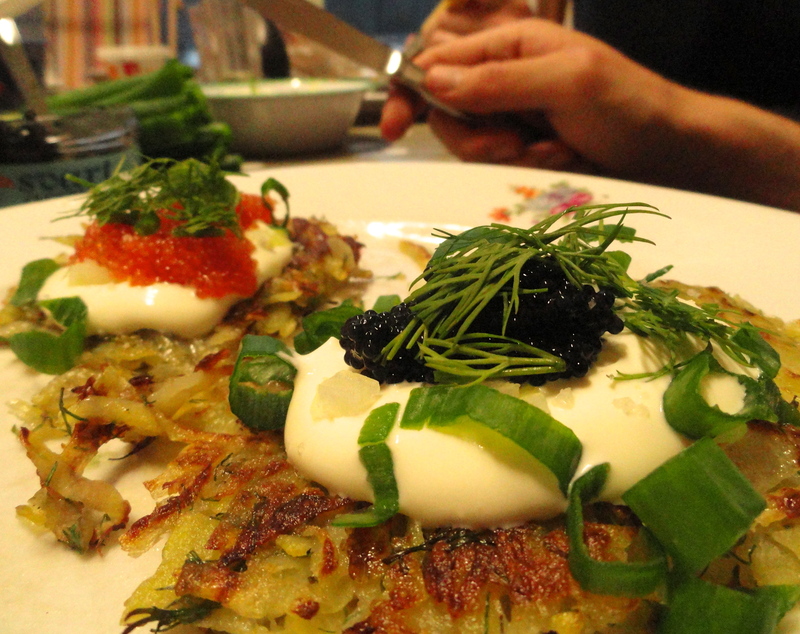 Poach the egg. The easiest way to do this is to boil some water, add a tablespoon of vinegar to it (helps the whites stay together) and slide it from a bowl into simmering water. 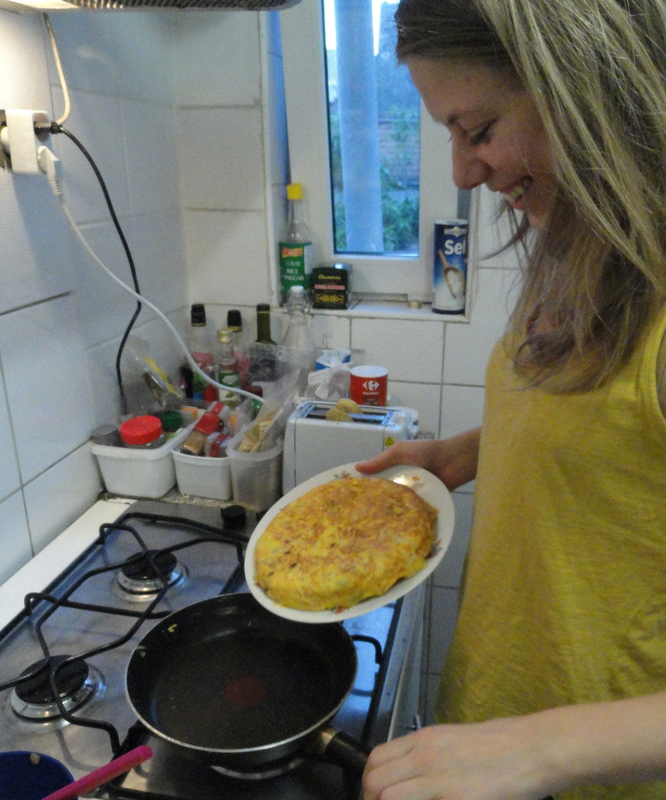 Take it out after three minutes, taking care not to break the yolk. 6. 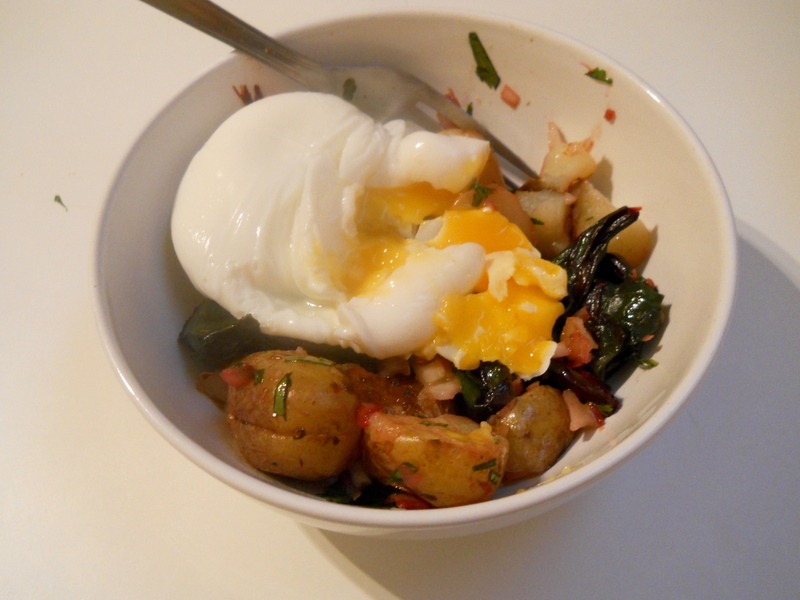 Serve the salad into a bowl or plate, add the egg on top. Break the egg and enjoy!